Cataract surgery has saved millions of people from seriously impaired vision, including blindness. Today, there is even more incentive for patients with cataracts to attain treatment as early as possible, before the progressively debilitating disease gets worse. 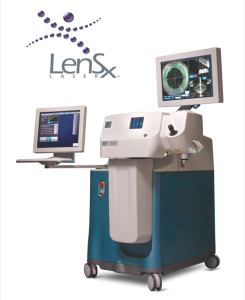 The LenSx® Femtosecond Laser is one of the most revolutionary new technologies in the field of cataract surgery, designed to remove cataracts without the use of a surgical blade. The LenSx® Femtosecond Laser can also be used to treat presbyopia, a condition that is common among people over 40 and causes problems with near vision. 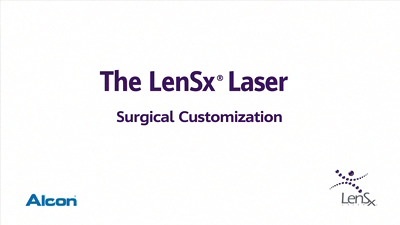 The LenSx® Femtosecond Laser allows our eye surgeon, Dr. Alan Faulkner, to remove dangerous cataracts without using a surgical blade. With help from a custom-guided laser and a computer-generated image of the precise dimensions of your eye, our surgeon will make small corneal incisions or anterior capsulotomies to remove the cataract with laser energy. If you have opted to have your natural lens replaced with a lens implant, that part of the procedure will be performed immediately after cataract removal. Since the LenSx® Femtosecond Laser is designed only to remove cataracts, not to improve vision after cataract removal, lens implants can provide significant improvement of your vision once cataract surgery is complete. However, it is important to remember that there are no guarantees that you may not need corrective eyewear, like eyeglasses or contact lenses, even after lens implantation. Cataracts can severely impair your vision and should be removed as early as possible. With the LenSx® Femtosecond Laser, you can attain cataract removal with the most precise and accurate treatment possible. Our experienced cataract surgeon, Dr. Faulkner will explain all aspects of the LenSx® Femtosecond Laser with you during your initial consultation and help you decide whether this procedure is the best option for your needs. The VERION™ Image Guided System, by Alcon Laboratories, is an innovative planning technology that increases precision in refractive cataract surgery. Aloha Laser Vision was the first in Hawaii to receive the VERION™ Imaging System at its ambulatory surgical center. With the advanced new device, our eye surgeon, Dr. Alan Faulkner, is able to provide consistently accurate results. The system helps with astigmatism management and IOL implantation, allowing our eye surgeon to further customize the settings for optimum results. The cataract surgery team at Aloha Laser Vision is committed to embracing the most advanced technologies to enhance your vision to provide optimal results after your procedure. With the ORA System, your vision can be customized to an even greater degree during cataract surgery. ORA is a revolutionary new option that allows our doctors to obtain a more accurate assessment of the power of your intraocular lens (IOL) during your cataract procedure, reducing the possibility that adjustments will need to be made later. ORA is used with all of our premium lens procedures to help make sure your IOL offers you the best vision improvement as quickly as possible. For those patients with astigmatism or who previously have had LASIK or PRK surgery—or even those who choose a multifocal lens implant—ORA optimizes your results by allowing Dr. Faulkner to further improve accuracy and help to reduce the need for eyeglasses after your procedure. Dr. Alan Faulkner will be happy to meet with you in consultation to discuss the cataract surgery options available at Aloha Laser Vision. You are encouraged to ask any questions you may have, and they will be happy to address your concerns. Please contact Aloha Laser Vision to schedule an appointment.